Our team is looking forward to welcoming you to the hotel. Thanks to the location, both The Hague City Centre and Scheveningen beach are only 10 min away by public transport or by car. Do not forget to experience our fitness center with sauna. You and your family will quickly feel at home at Novotel. 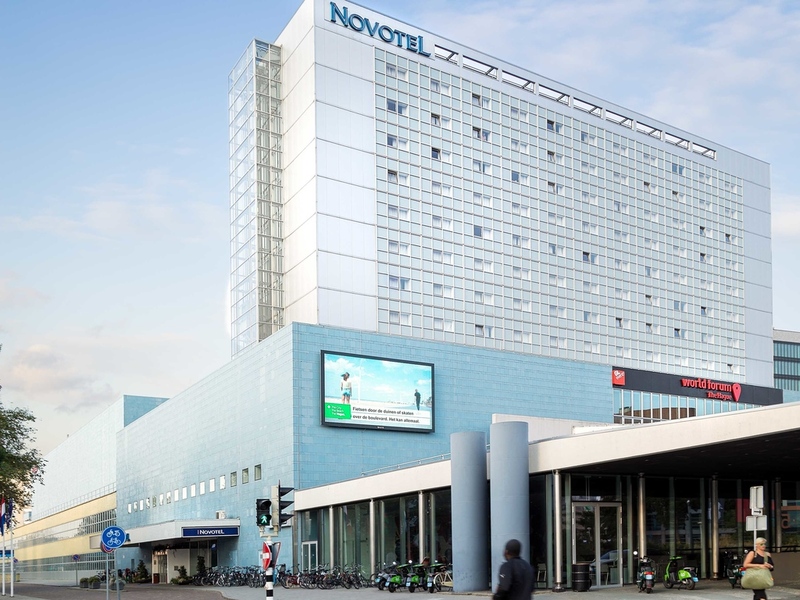 Novotel Den Haag World Forum is a family friendly 4-star hotel located above the World Forum convention centre and theatre. The hotel is not far from the seaside resorts of Kijkduin and Scheveningen, reachable within 10 minutes with public transportation or by car. The Madurodam miniature park and Omniversum movie theatre are a few minutes' walk away. The city centre is also easily accessible by public transport and has many highlights to explore. If you are in The Hague, we urge you to visit the Mauritshuis, the Knight's Hall at the Binnenhof and the Panorama Mesdag. When visiting the city with children, a trip to Madurodam is a fun day out. The beach can be reached in 10 minutes by tram or car. Our hotel is ideally located in the Statenkwartier of the 'Court City'. The Gemeente Museum and Museon are within walking distance of the hotel. For a relaxing walk or picnic, the nearby recreation area 'de Scheveningse Bosjes' is the place to be. The bar area is open daily from 5pm through midnight (5pm through 11pm on Sundays). Limited choice of hot dishes available daily between 5pm and 10pm. No restaurant serving light meals made the experience a bit less than perfect. They were accommodating when they realised that there were 4 of us with 2 children & had to put in an extra bed for one of our children. Quick efficient service..only problem was €5 credit for not having room serviced was not applied to my bill...I was unaware I had to get a voucher and bring it to the bar..I thought it would be applied automatically... Emailed hotel but no offer to apply it retrospectively. Pretty average hotel with nothing special to remark upon. The only real reason for staying here is if you are at an event at the World Forum and therefore right next door. For a 4star hotel competing with the other 2 near you, it's the worst. Your entrance is horrible and not welcoming. All is set up quite sober and not very pleasing. The hotel was beautiful and clean. The breakfast was delicious and service was very nice and helpful. For me that have frequent meetings at EUROPOL this is the most convenient Hotel. Practical, clean, and convenient However , the fridge at my room was not working. In addition its light kept flashing all night. It did not bordered me but maybe other guest will be no happy . What is the point of having a fridge if there is nothing inside , i.e. no bar service. Satisfied, but I would wish there was facility for lunch and Dinner at the Hotel, instead of going to look for such a facility outside the Hotel; it is inconvenient. As observed, I am satisfied and I had an occasion in the past to stay at this Hotel for about three weeks around March, 2013.